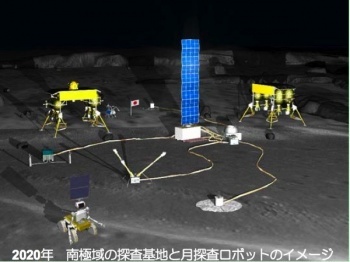 Japan plans to colonize the moon, but only with robots for now. While traveling to the moon has hit the U.S.'s back burner, Japan has put it squarely on the front one. In fact, it might be boiling over, with the Japanese government allocating $2.2 billion to send robots to the Moon to build a base. Not just any robots either: Japan plans to send 660 pound "humanoid rover robots" operating on tank treads that will wield high definition cameras, seismographs, solar panels, and rock-gathering arms. These bots are planned to touch down on the Moon in 2015 to survey the surface. Once the Moon has been properly surveyed, the rovers will construct a base near the south pole. This will be used only as a base of operations for the robots, not for humans, sadly. But who knows, maybe it'll lead to human colonization of the Moon someday in the far flung future. For now, the robot base likely won't be built until 2020. This project has potential because if anybody does robots right, it's Japan. In anime, anyway. It's nice to see a country focusing on building a base on a planetary body other than the Earth, but hopefully the Japanese won't discover an alien symbiote or zombie-creating disease and bring it back to our surface.